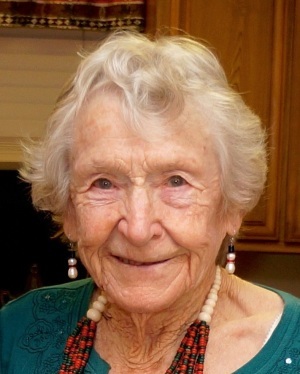 Mary Smiley passed away March 21, 2019, at the age of 95. She was born on Christmas Day, 1923, on a farm in Mapleton, Kansas to Harry Lafayette Sutterby and Bertha Jane Bruner. The youngest of seven children, she outlived them all: Myron, Walter, Esther, Dorcas, Agnes, and Merle. Mary graduated from Blue Mound High School as valedictorian in Linn, Kansas in 1941. At the age of 18 she moved to Kansas City, Missouri to attend business school, then wanting to see the world, she joined TWA in New York in 1946 as a bookkeeper and was able to benefit from complimentary travel. During the war, she traveled on a troop ship with a small group of women to Hawaii to work in the civil service as a bookkeeper. Her love of travel and seeing the world ultimately led her to move to Saudi Arabia in 1948 to work for the Arabian American Oil Company (ARAMCO). There she met Walter Carl (Pete) Smiley who also worked for ARAMCO, and they were married that year. Saudi Arabian life, while challenging, offered many benefits, including swimming, horseback riding, sailing, and three months of vacation every other year. With children in tow, they traveled throughout Asia, Europe, Australia, the Pacific Islands and home to the States to visit family in Hawaii, California, and Kansas. She kept a full life in Arabia by volunteering at the hospital, sewing her children’s clothes, and caring for horses. She was very active in the garden club there and won prizes for her flower arranging. Her Kansas farming roots never left her, as she always loved working in the yard and was able to transform her sandy desert back yard into a beautiful place for her family. After almost 25 years in Arabia, she and Walter retired to Vista, California in 1971 and built a ranch house on three acres which they filled with horses, both their own and boarders’. Their home provided a gathering place for family with horseback riding, Saturday dinners, many Easter egg hunts and other celebrations, and was an outdoor sanctuary for her grandchildren to run and play. She also spent her time baking with the grandkids, sewing, quilting crocheting, winning at Scrabble, and ‘working’ crossword puzzles. Remembered as a loyal neighbor, gracious hostess and loving grandmother, she helped the neighborhood elderly with errands and chores. Her husband died in 1993, and she and her three horses then moved to Escondido to be closer to family. She volunteered with the Escondido Senior Gleaners and Palomar Home Health for several years. After becoming partially blind, she was involved with the Vista Center for the Blind and the Braille Institute San Diego, attending weekly classes there for over 15 years. Her final years were spent at Felicita Vida in Escondido, where she enjoyed the friendly staff and residents, excelling at their trivia and crossword games, even in her 90s. She is survived by her children and their spouses Deborah (Butch) Yamashita, Margaret (Leland) Womack, Michael (JoAnn) Smiley, and Leilani (Jim) Page. She also leaves to cherish her memory 16 grandchildren, 21 great-grandchildren, 4 great-great-grandchildren, and many nieces and nephews. She was preceded in death by her husband Walter, sons, Steven (Julie) and Peter (Kiki), and granddaughter Lindsey. In lieu of flowers, donations can be made to the ALS Association or the Braille Institute.